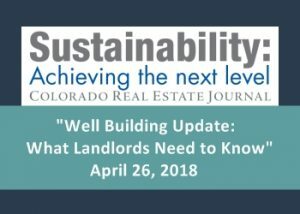 On April 26th, Thomas Koch, VERTEX’s Vice President of Industrial Hygiene & EHS Services, will be a panelist on “Well Building Update: What Landlords Need to Know” at CREJ’s Sustainability: Achieving the Next Level. This is CREJ’s principal Green Building event of the year with more than 200 attendees anticipated representing owners, brokers, property managers, architects, engineers, consultants, contractors, among others. The event will be held at the Hyatt Regency Aurora-Denver Conference Center and attendees will earn 4 hours of real estate continuing education credit. “Well Building Update: What Landlords Need to Know” will run from 1:15pm to 2:00pm. To learn more about VERTEX’s Industrial Hygiene & Building Sciences services, please call 888.298.5162 or email info@vertexeng.com.